The layout of the About My Core tab is illustrated below. The fields on this page can be edited by clicking on the pencil icon on the right. Description: A section that can contain a description of your core, instructions, notes, etc. The name of the core can be edited in the Name field. The Description section below is a free text panel that can contain any information you would like to display about your core. Heading format: Make sure to apply headings only on a single line; if applied across line breaks you’ll see multiple horizontal lines after saving. Plain text: Paste any blocks of text content as plain text so that any foreign formatting is stripped. Then style as you want. Images: Your iLab support team can help you with uploading images to an externally accessible server and providing a url. This helps to decrease page loading time and allows for edits of image size. Target: Can either be "None" (the link opens in the current window, i.e. replacing the iLab window) or "New Window" (the link opens in a new window or tab, leaving the iLab window in tact). 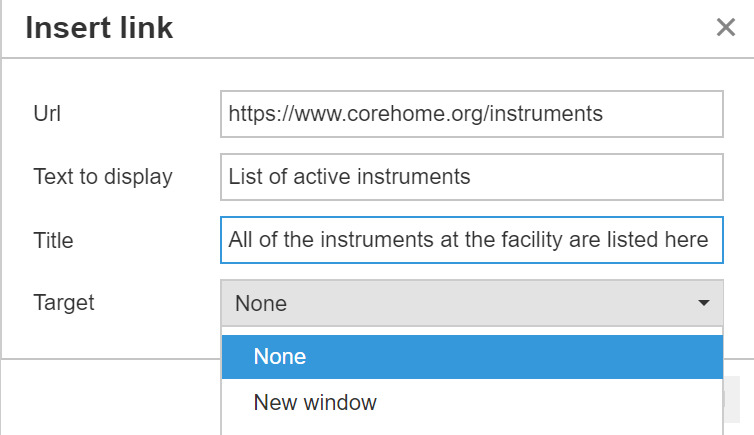 Viewing changes: Once you have saved your changes, be sure to view changes internally on the 'About our Core' tab and also externally when not logged into iLab. Don't forget to save any changes with the "Save Service Center" button at the very bottom of the screen. You can use this section to show an interactive Google Maps window with the location of your core (or to simply show the address of your core). Click on the Google Maps link to begin mapping your location. Be sure to grab the embedded link to paste in the box to make the map show. You may add as many contacts as you wish. To add a contact, click on the green plus sign. To delete a contact, click on the red X beside the contact you would like to remove. 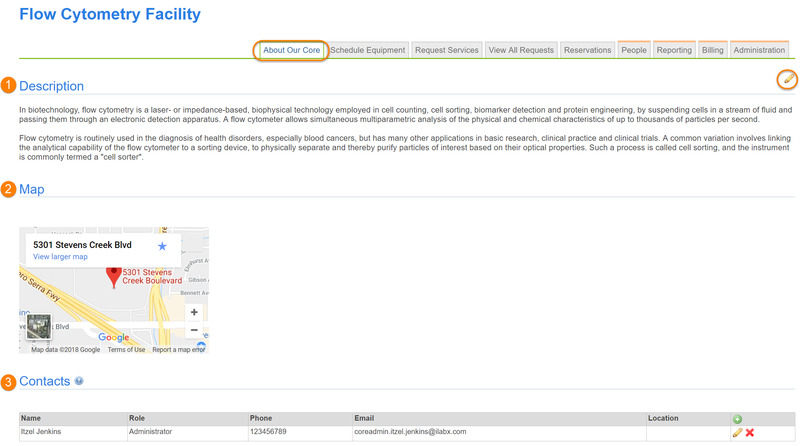 You may select multiple classifications for your core that allow for your site to be searched in other areas of iLab. The classifications are pulled from the eagle-i-ontology classification system. The iLab system will begin to search the eagle-i-ontology database after you have entered two letters. Select the correct classification from the drop-down box to associate it with your site.